We welcome you to the website for the Women’s Wellness Center. 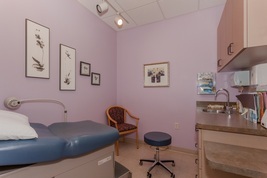 In addition to providing full spectrum gynecologic and surgical care, Dr. Mary Wellhoner and our two nurse practitioners, Laurie Smith and Sherri Aikin, offer complementary services that many women need, such as specialized hormone therapy, stress reduction, weight management and sexual counseling. We invite you to browse our website for more information about our providers, specialized services, location, contact, patient education and more. I have been a patient for a number of years and have experienced quality care from Dr Wellhoner. I have been touched by the personal approach to health care from the entire office. Her nurse is wonderful and Dr Wellhoner's APN is also a great asset to her practice. I appreciate their holistic approach to medicine. It is so refreshing to be able to talk with a doctor and her staff and have them really listen to you..
Wouldn't go anywhere else...EVER.Thanks for always taking so much time with me and my girls on our visits. I've never felt rushed and feel that you always listen to my issues. I would refer you to anyone looking!!!. I have always been very happy with the care from Dr Wellhoner and her staff. They listen and actually care for their patients. I rarely have to wait to be seen and am not rushed through the appointment. I appreciate the holistic approach to health care from the entire office. The providers and staff of Women’s Wellness Center (WWC) strive to be of service to women in achieving optimal health by providing a holistic approach to women’s health in a caring, warm and friendly environme﻿nt. We seek to provide not only excellence in gynecology, but also sound guidance for women in exploring alternative therapies and integrative medicine.